Towards the end of last year, myself and Nicola were invited to try out the menu at The Shore Grill & Fish House which is housed within the recently opened Double Tree by Hilton Edinburgh - Queensferry Crossing, which as the name suggests overlooks the new bridge that spans the Forth, as well as both the Forth Road and Rail Bridges. Operated by the Cairn Group, the creators of the award-winning Twenty Princes Street and Juniper cocktail bar in the heart of Edinburgh City Centre, The Shore offers sanctuary from the city and hopes to offer a destination venue that will be the perfect place to enjoy drinks and dinner for friends and family alike. 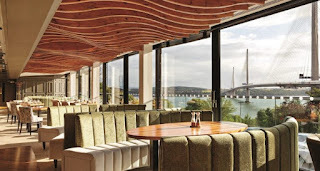 The restaurant boasts stunning views over the Forth with all three bridges visible from most tables however as we visited on a winter evening we have no photos to demonstrate these phenomenal views. If you manage along during the day, you will be met with wonderful floor to ceiling views of the Queensferry Crossing. I had been looking over the menu before our visit and the thing that really stood out to me was the drinks menu which has a fantastic selection of classic and house cocktails, wine, premium spirits and craft beers ensuring that there’s something for everyone. As we were in no rush, we decided to kick things our night off with pre-dinner cocktails with both of us opting for the Daffy’s 75, a variation on the classic French 75 cocktail made using Daffy’s Gin, lemon juice, sugar syrup, lemon sorbet and topped with champagne. I love champagne cocktails and this twist on a classic is so refreshing and a great way to prepare the palate before dinner. The wine list is well balanced and well priced with the most expensive white wine just £40 for a bottle of Chablis while the red wine selection boasts wines from both old and new world including a big hitting Amarone Della Valpolicella topping the pricing at £65. We were both in the mood for white wine and opted for the 2016 Pulpo Albariño at a modest £30. Albariño is one of our favourite wines at the moment and this offering from Pagos Del Rey was very good. 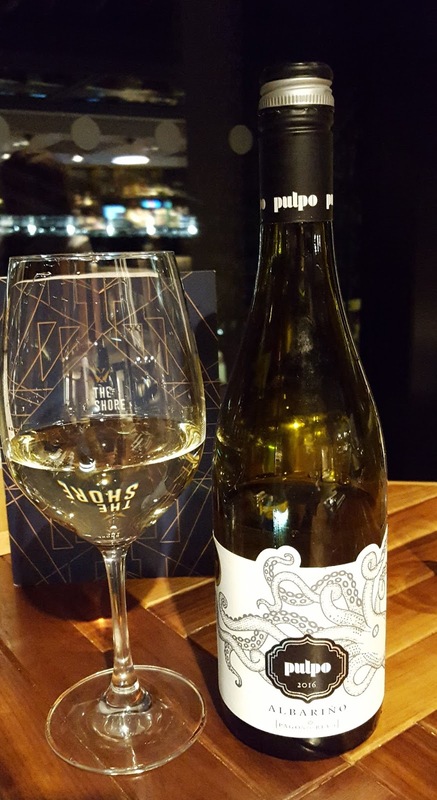 Pale in colour with aromas of flowers, peach and apricot is big on flavour with a salty mineral finish, this great wine to drink on its own and a fantastic match with our seafood starters. 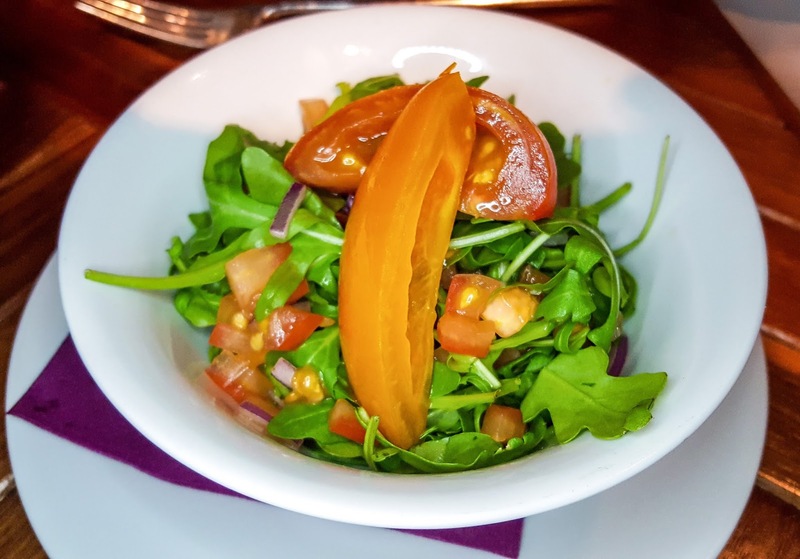 We spent what seemed like an age trying to decide what to order but both struggled as the menu is loaded with lots of our favourites with fresh seafood and prime meat featuring heavily. 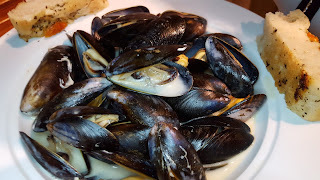 In years gone by, Nicola would have been all over the scallops but in recent times she has developed a fondness for mussels and on the night, she decided to start with half a kilo of Scottish rope grown mussels in a hay smoked Cullen Skink sauce. The mussels were plump and meaty and had been cooked perfectly. The Cullen Skink sauce was a well thought out accompaniment although we both struggled to detect much in the way of flavour from the hay smoking process. That said, it didn’t stop Nicola working her way effortlessly to the bottom of the bowl. The mussels were served with a couple of slice of homemade focaccia that worked well to mop up the remainder of the creamy Cullen Skink. Nicola’s decision to start with the mussels, paved the way for me ordering the pan-seared Scottish Scallops with black pudding and apple. When the scallops arrived, I’ll be honest and say that was a little disappointed. Don’t get me wrong, the dish was presented nicely however the portion size was smaller than I had expected although had the scallops been presented on a round plate rather than the very eye catching oblong platter, perhaps the portion size would have looked more impressive? Putting that to the side, the dish was delicious. 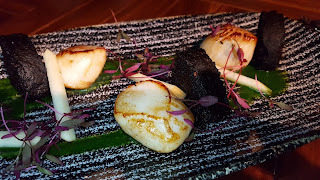 Scallops and black pudding are best friends and should be served together more. 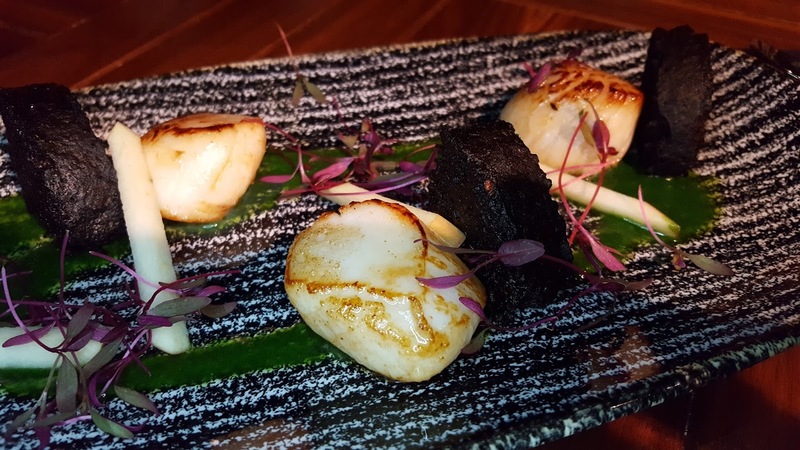 Soft sweet scallops, crispy spiced black pudding are the perfect foil of taste and texture while the addition of green apple matchsticks added a little acidity that cut though the spice and freshened the palate. The main menu offers a wide selection of comfort food and Nicola decided to stick with a ‘pub grub’ classic by ordering The Shore Haddock Supper. 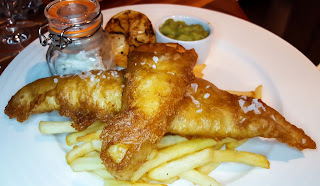 My good lady is a bit of a connoisseur of fish’n’chips and when her Caledonian Three Hop beer battered haddock arrived, she was immediately impressed. Two huge fillets of fish rested atop a bed of French fries (triple cooked chips are also available) and were joined on the plate with mushy peas, a charred lemon and a little pot of homemade tartare sauce. The fish was cooked perfectly, the batter was crisp and well seasoned while the haddock was firm and flaky inside. The accompanying mushy peas were as good as we’ve had, full of fresh pea flavour with just enough vinegar to work with the fish. Nicola isn’t a fan of tartare sauce but I did sneak a taste and thought it was a pretty good homemade version. The charred lemon was a nice touch as this completely changes the flavour of the lemon juice, adding a slightly sweet lemon flavour when squeezed over the top of the fish. Overall, this was a very good fish’n’chips. 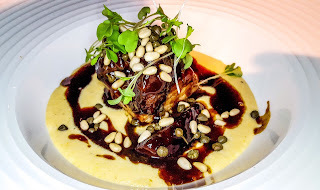 For my own main, I opted for slow cooked pork belly with smoked polenta and toasted pine nuts which turned out to be one of the best plates of food that I ate last year. The pork belly was soft and tender, falling away at the slightest touch from the fork. The smoked polenta was inspired - smooth and creamy but with just enough smokiness to cut through the rich, sweet sticky jus that accompanied the pork. Toasted pine nuts are one of my ultimate luxury items and their earthiness worked wonderfully with the big hitting flavours from both the pork and polenta. As comfort foods go, this hearty dish was as good as they come and one that I will be trying to recreate at home. I’m generally not a fan of ordering side dishes but as my main didn’t come with any vegetables, I decided to get a small salad with my Pork Belly. 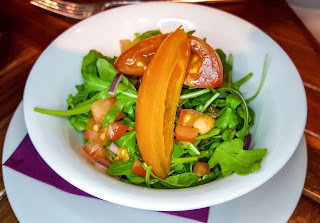 In fairness, I should probably have ordered some greens to cut through the richness of my main but in the end, the dressed rocket leaves, tomato and onion added enough contrast and acidity to my main to do the job necessary. 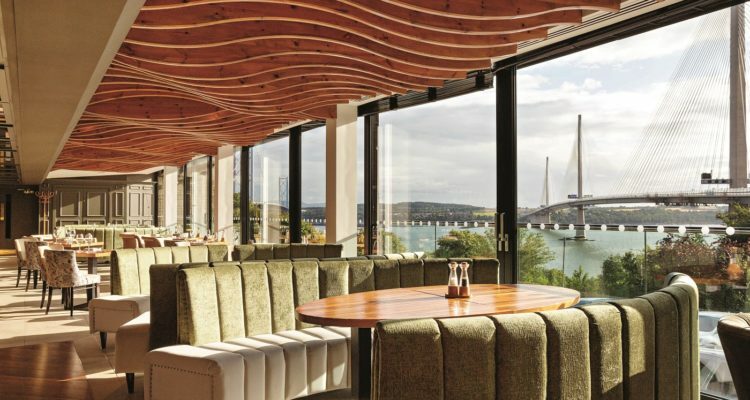 As mentioned earlier, The Shore Grill & Fish House is located within the Double Tree Hilton Edinburgh - Queensferry Crossing but don’t be fooled into thinking that this is a hotel restaurant. 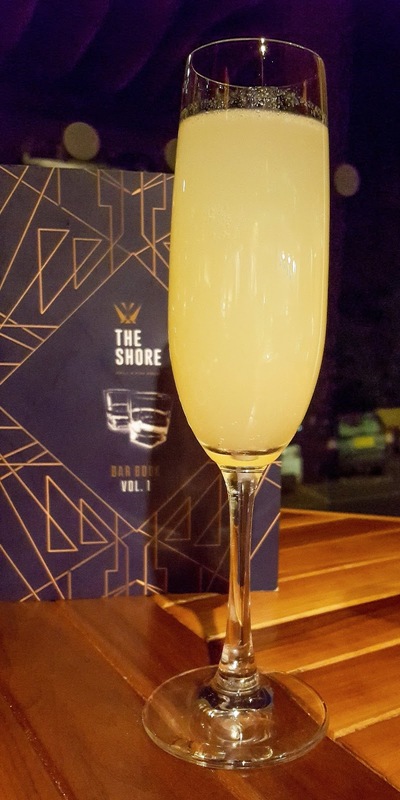 The restaurant operates very much as a go to venue and proved to be a popular place as we witnessed over the course of the night and based on our visit, it’s safe to say that the locals have taken The Shore to their hearts. We dined as guests of the hotel but my review above is an honest account of our experience on the night. We would like to thank the management and staff for their hospitality and generosity on the night and which them all the best for the future. 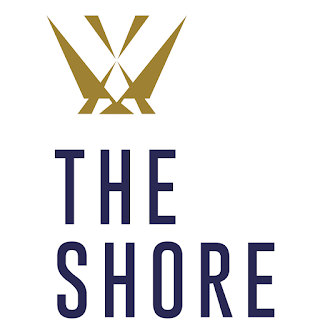 If you happen to be on the northside of the The Forth then I would have no hesitation on recommending The Shore Grill & Fish House if you’re looking for somewhere for lunch or dinner. 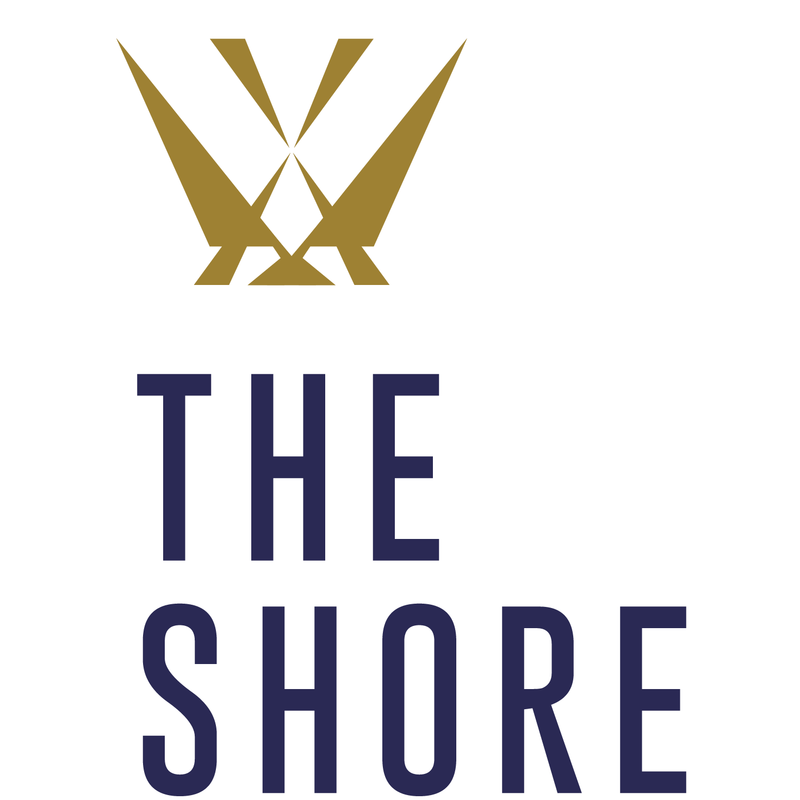 Keep up to date with The Shore Grill & Fish House on Facebook and Twitter.